It seems that a recent user generated poll on Facebook has Obama’s followers very upset and all up in arms, figuratively at least. It asked a simple, unpleasant question – should�President Obama be killed? Quite unsurprisingly Obama’s devout followers raised secular hell over this and reported the whole thing to Facebook and the US Secret Services. 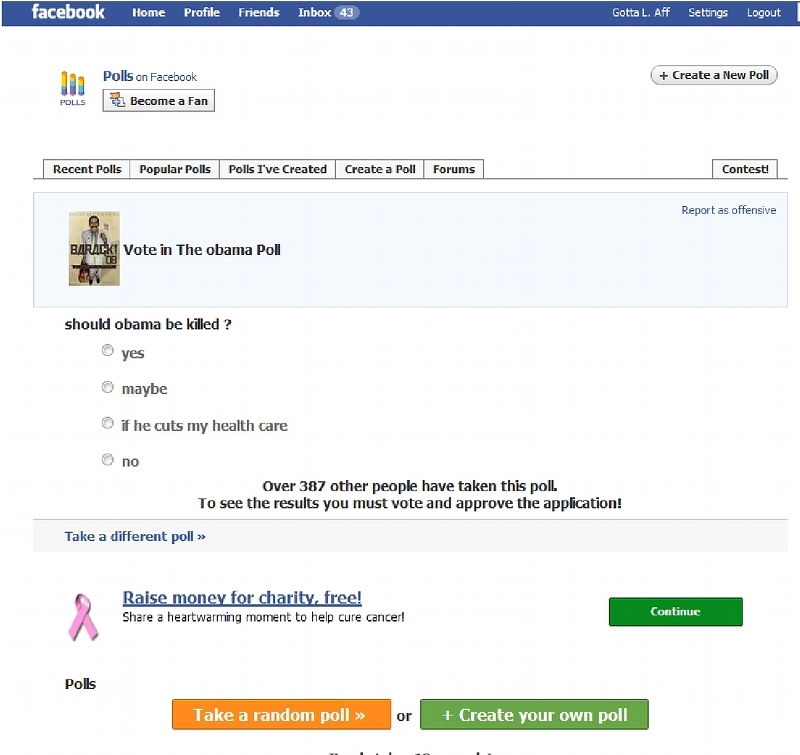 Facebook, being ever an avid avoider of controversy, pulled the poll off their social network. The US Secret Service is currently looking for the individual who made the poll, though any form of prosecution is highly and thankfully unlikely. Was the poll crass? Certainly and in the extreme! Given the Liberals’ and Blacks’ overwhelming fears and the incessant meme of Obama’s assassination that they’ve perpetuated, a poll of this nature is cruelly akin to poking sticks at caged animals. Was the poll stupid? Yes, and quite juvenile as well. The choices it contained were sophomoric and showed a gross lack of knowledge of both history and the American political system. In truth I see little worthwhile use for the above poll except as a possible reminder to President Obama that he not universal loved or admired and the growing displeasure the American people have shown him should already serve that purpose well enough. I’ve recreated it mostly because I believe that outlawing such questions in the public forum is one of the worst forms of tyranny, and one Liberals have grown exceedingly fond of. In case anyone cares, I voted “No.” I see no reason at this juncture to kill President Obama. I cannot say that he has acted in a manner that makes calling for his removal necessary. Since I’m not even, as yet, demanding that Congress impeach President Obama, how could I endorse his assassination? I can’t see where violent action is merited when civil measures haven’t even been attempted as of yet. The sole benefit that I can find in the poll, other than the visceral joy that scaring and angering the Liberals gives me,� was that it, at its core, asked – in an admittedly piss-poor manner – a very valid and uniquely American question – at what point is violence against the US government or individuals within it acceptable? If you don’t believe that is a valid question then you’ve either forgotten or never learned the history of America, how it was founded, or the expectations and intent of our founding fathers. There may well come a time when Americans have to use violence to depose our government or people within it. If we can’t even ask the question, we’re doomed to tyranny. This disturbing video was filmed at the B. Bernice Young Elementary School in Burlington, NJ and uploaded on June 19, 2009. This is what happens when Americans foolishly and naively allow Obama’s filthy cultists to have access to our children. I’d like to say that I guess that the Liberals now understand what the complaints were about Obama’s Back to School Speech – but such understanding is beyond them. If you’re an American man of a certain age just admit that you’ve got an Inner Dork – especially when comes to Star Wars, Jedis, and lightsabres. Hellfire, even the ever campaigning President Obama has one, and he seems less than ashamed of it. Of course what’s not shown in the picture above is the poor Secret Service agents, one in the President Bush mask and the Emperor Palpatine robes and the other with the Vice-President Cheney mask and the Darth Vader costume. Of course it’s easy for the Evil Old Men in Beijing to coerce their population into at least mouthing harmony with the regime’s agenda and ant-like collectivism. When the “or else” in question is having your vital organs harvested by the State, it’s amazing how tractable people become. During President Obama’s Sunday morning talk show blitz he bitterly rejected the criticism that his proposed mandate that all Americans must by law carry health insurance coverage would burden the American people with yet another new tax, something that the President has promised during his campaign not to do. The truth of the matter at hand can be found in Subtitle D – Shared Responsibility of Senate Finance Committee Chair Max Baucus’s proposed America�s Healthy Future Act of 2009. Excise Tax. The consequence for not maintaining insurance would be an excise tax. If a taxpayer�s MAGI is between 100-300 percent of FPL, the excise tax for failing to obtain coverage for an individual in a taxpayer unit (either as a taxpayer or an individual claimed as a dependent) is $750 per year. However, the maximum penalty for the taxpayer unit is $1,500. If a taxpayer�s MAGI is above 300 percent of FPL the penalty for failing to obtain coverage for an individual in a taxpayer unit (either as a taxpayer or as an individual claimed as a dependent) is $950 year. However, the maximum penalty amount a family above 300 percent of FPL would pay is $3,800. The excise tax would apply for any period for which the individual is not covered by a health insurance plan with the minimum required benefit but would be prorated for partial years of noncompliance. The excise tax would be assessed through the tax code and applied as an additional amount of Federal tax owed. No excise tax will be assessed for individuals not maintaining health insurance for a period less than or equal to three months in the tax year. However, assessed excise taxes for those not insured for more than three months include the entire duration the individual was uninsured during the tax year. Leaving President Obama’s snideness, bitterness, and obviously growing desperation aside for the moment, this was one of his more stupid lies, reminiscent of his prevarications about key support for ObamaCare. He really should stick to well-nuanced disingenuousness about Americans being able to keep the healthcare if they like it, abortions not receiving federal subsidies, and illegal immigrants not getting expanded coverage. ObamaCare mandates that every individual American must purchase health insurance and the “Baucus Bill” would institute a tax – specifically an Excise Tax – on anyone who failed to do so. It’s a tax, idiot! It’s even called a tax in the bill in question.